The beloved icon Keytar Bear has been attacked. Three New Hampshire juveniles could face hate crime charges after an an alleged assault on the Boston musician known as "Keytar Bear." Keytar Bear is a well-known street musician who dresses in a bear costume and plays music in various places across Boston. Boston police responded to a call Saturday at 4:40 p.m. in the area of Congress and State streets downtown for an assault and battery in progress. A responding officer saw the well-known Keytar Bear surrounded by a group of young men in what appeared to be a fight. When the officer approached with the lights and sirens activated on his cruiser, the young men fled on foot. Witnesses were able to point the officer in the direction of the suspects, observing the young men climbing up the scaffolding of a building and laying down on a platform in an attempt to hide. When the officer ordered the suspects to come down, they complied. Following an investigation, police learned that Keytar Bear had been attacked by the suspects while he was playing music near Faneuil Hall. The suspects allegedly ripped off Keytar Bear’s mask before striking him several times in the face and body while using racial slurs. Police said when witnesses attempted to intervene, the suspects also hurled racial slurs at them before fleeing. 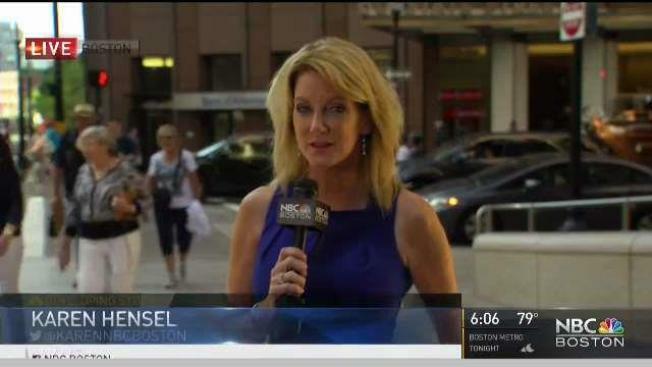 Jessica Baldwin, of Nashville, Tennessee, was in town for Sail Boston with her 10-year-old son, Thompson Fine, when they witnessed the attack. "Right after I took the picture of the guy with his arm around Keytar Bear, he slammed his face down into the ground, took his bear head off," Baldin recalled. "I didn't see the punching, but you could hear the screaming." Police said the suspects damaged Keytar Bear's equipment in the attack. The man sustained a facial laceration and swelling to the right eye. "He later said he felt it was a hate crime. That it was racially driven," Baldwin said. When the suspects allegedly stole Keytar Bear's tips, that's when Baldwin's son stepped up to the plate. "I gave him $4," Fine recalled. "And I got a sticker badge." Since news of the attack broke, there have been numerous online messages to the anonymous bear. A GoFundMe account set up to help him purchase new equipment raised $4,800 as of Monday afternoon. "I am heartbroken about what happened. We love you and what you give to Boston and we all have your back. You are a treasure," one fan wrote. Saturday's attack was the fourth on Keytar Bear over the years. The three juvenile suspects — a 15-year-old from Londonderry, a 16-year-old from Salem and a 17-year-old from Manchester — were arrested and charged with assault and battery and disorderly conduct. The 16-year-old was also charged with possession of alcohol by a minor. Prosecutors said they are also reviewing the case for potential hate crime charges. The three teens were arraigned on Monday and released into their parents' custody with orders to stay away from the victim, witnesses and Faneuil Hall.